Gilmar Mauro discusses Brazil's current political context and it's implications on small farmers. Unlike other former European colonies in the Americas, Brazil has never implemented agrarian reform. With the world’s most unequal land division, 3 percent of the population owns approximately 2/3 of the arable land. [ii] When former president João Goulart attempted to enact agrarian reform in 1964, he was thrown out of office in a U.S.-backed military coup. [iii] As the resultant dictatorship approached its end in the early 1980s, a new peasant-based social movement arose in Rio Grande do Sul state, called the Movimento de Trabalhadores Rurais Sem Terra (Landless Rural Worker’s Movement, MST). Incorporating theories from liberation theology and intellectuals like Paulo Freire, Marx, and Gramsci into practice, landless rural workers organized in groups to occupy fields of stolen land, resist eviction (sometimes fatally), and farm. [iv] Using an innovative organizational structure of upwards and downwards democratic accountability through voluntary assemblies at the family, village, regional, state and national levels, the MST quickly spread across the country and now operates in all 26 Brazilian states, with “Friends of the MST” groups operating worldwide. Although it has yet to reach its goal of enacting agrarian reform and building a socialist society, there are currently 400,000 families living and farming in MST agrarian reform villages across the county and the movement has successfully pressured the government to create a series of innovative policies, such as the Programa de Aquisição de Alimentos (Food Acquisition Program/PAA), ratified by former President Lula, which requires all public schools and hospitals in rural areas to purchase all food for their meal programs at subsidized prices from local family farmers. The MST has a gender-balanced national directorate of 52 individuals, with two people elected periodically in each of its 26 state assemblies. Gilmar Mauro is a member of the national directorate, representing the state of São Paulo. 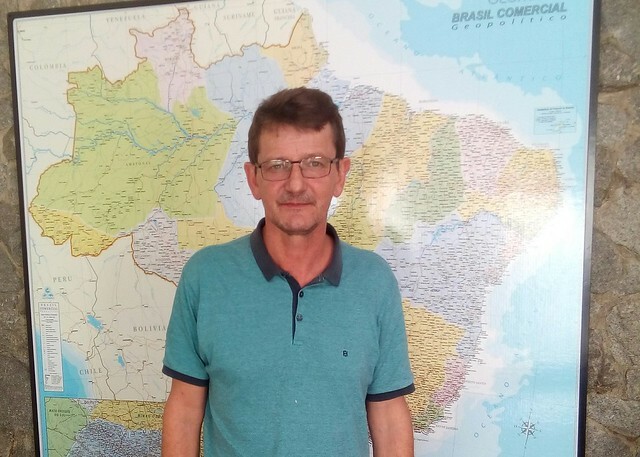 I caught up with him at the MST national secretariat in São Paulo on August, 25th, 2017, to talk about the current political context and its ramifications for small farmers. In Brazil, most food is still produced by family farmers. What are some challenges that small farmers face in the current political context? Most of Brazilian agricultural production is, in fact, produced by family farmers, but they are the group most affected by the policy and program cuts that the current coup government under Michel Temer is enacting. Examples of this include the current lack of access to credit and lack of investment. However, the Brazilian agricultural system was organized to favor exports, especially large-scale agriculture, as part of a strategy to balance the trade deficit in Brazil. Since there is a large deficit in government spending, including servicing the debt, all of the production of commodities in general, whether in agriculture or mining, are geared toward exportation with the goal of obtaining a trade surplus to stabilize the trade equilibrium. So the priority is on large capital, in detriment to the millions of family farmers who survive by producing food. We have to change this. I don’t believe that this only holds true for Brazil, but we have a great challenge to change the agricultural production model. The current model poisons the environment and poisons the population. This agricultural production model destroys natural resources and biodiversity. We have to have a debate in society to discuss the role of agrarian reform, and the debate should be over, ‘what type of food do you want to eat?’ and ‘how do we want to use our soil, water, and natural resources?’ If this is the way that Capital is operating, things will continue the way they are, but it will have environmental impacts on this generation and on future ones. If you continue eating these foods from large supermarket chains, it will impact your health and that of those who produce it. We also have to return to the debate over technological paradigms and technologies that do not damage the environment, and that we can use in agriculture in Brazil and the world, and we think that agro-ecology is an economic and social alternative that is much more sustainable than this model that we are currently living under. The English-language press – even ostensibly progressive newspapers — has adopted the conservative mainstream language of Brazilian media to describe the MST. For example, I saw a recent Guardian article which states that the MST “invaded” a few plantations. Why does the MST instead use the word “occupation” to describe these activities? “Occupation” is a term that we use because it is related to the large land holdings that were illegally appropriated by various sectors of Brazilian society, including the corrupt politicians who used public money to acquire land, and what is called ‘grilhagem,’ which involves illegally forging documents to appropriate large land holdings. I can give you a specific example here from São Paulo state. Cutrale, an orange juice producer which also operates in the USA, appropriated land that, in 1908 or 1909, was originally earmarked by the federal government for settlements for recently arrived European immigrants. The villages were never built, and the lands were illegally appropriated by economic groups that destroyed their natural resources. We use the word ‘occupation’ to describe appropriating illegally-acquired land that is used by large-scale ranchers and farmers that could and should fulfill their social function. This is the reason that, in our understanding, the challenges against the MST and agrarian reform are very intense. Let me put it into historical context. Our first law regulating land was passed in 1850 and slavery was abolished in 1888. Before 1850, land was public and was farmed with slave labor. In 1850, land became something that could be bought and sold and in 1888 slavery was abolished, bringing freedom to laborers. The slaves did not have money to buy land in Brazil. And differently from what happened in most of the world where agrarian reforms took place as a way to develop capitalism in the countryside (for example, there is the story of the union between the bourgeoisie and the peasants during the French Revolution to produce raw materials and food for the workers in the cities so that industry could transform agriculture into a market), agrarian reform never happened in Brazil. Brazil started by land distribution into hereditary captaincies; afterward, through large land grants called sesmarias, the plantation economy consolidated to its current state in Brazil. For this reason, the struggle for land and agrarian reform is a historical, fundamental battle in Brazil. We [the MST] organize occupations as a form of pressure toward agrarian reform. There is a law that permits homesteading in Brazil. If land does not fulfill its social function, it qualifies, in theory, for disappropriation. For land to fulfill its social function, it has to rationally produce, while respecting the environment and federal labor laws. But most plantation owners and ranchers don’t respect the environment or the labor laws, and even their unproductive land is rarely redistributed In other words, we have a historic political problem. This is why we say that the fight for agrarian reform is a fight to change the Brazilian power structure. Brazilian political power is, historically and contemporarily, deeply rooted in the land. Agrarian reform is a way to solve one of our country’s historic political problems. The MST was an important actor in the consolidation of the Partido dos Trabalhadores (Workers’ Party, PT). The PT party’s three historic rallying cries were Political Reform, Urban Reform, and Agrarian Reform. With 13 years in power, neither the Lula nor the Dilma Rousseff administration managed to push through any of these promises. Why does the MST continue to support ex-president Lula and the PT party? That is a good question, that is related to the Brazilian political struggle. It’s true. Agrarian reform did not happen in Brazil. We have settlement policies. These settlement policies are the result of a lot of struggles and death in the Brazilian countryside. It is a historical problem that the PT did not solve, that nobody has solved in Brazil, and we have to change the political power balance to advance the perspectives for deep agrarian and urban reforms. The MST has always positioned itself in Brazilian politics as an autonomous social movement. It has political autonomy. It is not organically tied to any political party, and we respect all the political parties on the Brazilian left. But we are living in a context of retrogression in Brazil and the world where forces, not just neoliberal but an entire neo-fascist ideology, are growing as has happened in other historical eras of crisis. We are facing a coup in Brazil — a political coup. It is a political coup that aims to take political power and apply a set of regressive measures to cancel what the working class achieved during recent years, including gains that occurred during the Lula and Dilma governments. Evidently, we did not advance in deep structural reforms, but there were important social advances that are now being dismantled [under the current administration]. It’s not particular to Brazil. This is happening in various parts of the world because, in our evaluation, there is a prolonged crisis with no way out in the short term. In fact, I don’t know if there is a way out of the economic crisis within the capitalist framework. A part of humanity no longer has space in this mode of production. We are confronting power and resisting against setbacks. This is why we are supporting Lula at the moment. We are acting to form resistance, including electing him to the presidency to move forward with social reforms. It’s not what we want for Brazilian society, though. We want to move forwards from a perspective of socialization. We defend socialism as a political and economical alternative for humanity, not just for Brazil. Nevertheless, the MST does not have the conditions to do this by itself. The MST is not strong enough to push through agrarian reform. Agrarian reform and changes in the agricultural model depends on a debate within the entire Brazilian working class and changes in the power structure. The MST is an important actor, but it is just one actor that is part of a set of actors. Together, we created the Frente Brasil Popular (Brazil People’s Front, FBP) with a lot of internal differences. But we understand that we have to face common enemies, and we have to build a unified political culture. We have a culture of political unity for the Brazilian elections, but we do not have a political culture of forming broad fronts for the mid- to long-term. And we are in this process now. I always compare these alliances to a wedding. Two people marry. They are different, even if they have the same gender, but they have common projects, and they develop them together. If one person subjugates another in this marriage, neither of them grow, and the marriage often dissolves. This is what political alliances are like. Common projects have common objectives, and we have to build these objectives collectively. There are static objectives and strategic objectives. Our tactic is to seek alliances with all progressive actors in Brazil and on an international scale to confront the fascist ideology and retrogression. A lot of people fit in this rainbow of alliances, and we need to be generous and patient. It’s like raising children. I, like a lot of people, have children. We have to say, “did you bathe yet? have you cleaned your room?” The left also has to have a historical patience in coalition building. In our point of view, nobody has any absolute truth, but everyone has goals. We all have ideas and we have to talk about these common ideas to face common enemies. Some may want to overcome the neoliberal order, others may go to the point of confronting the coup and neo-fascist ideas but don’t want to go all the way to socialism. This is a chapter that we will discuss and debate as the process unfolds, but not by searching for hegemony or allowing ourselves to be homogenized by others. For this reason, the PT is our ally, the Central Unica de Trabalhadores (Unified Workers Central/CUT) CUT labor federation is our ally, the people’s social movements in Brazil are our allies, and the other left political parties are also our allies at this moment in history. The largest general strike in many years took place on April 28. The following month there was a huge protest in Brasilia, the largest in that city’s history. At that moment it looked like the fight against the coup government was picking up momentum. The second general strike, despite being effective in some cities like Belo Horizonte and Brasilia, was not as large as the first one. And the night that the corruption allegations against Michel Temer were thrown out by Congress there were not very many street protests. It may look like the organized left is losing force at the moment. Is this analysis correct? What are the next steps in the fight against further consolidation of the 2016 coup? This, perhaps, is the central issue for us and for the whole world. There is a structural problem. Sometimes the left focuses on ideological differences that clearly exist — cooptation of sectors of the left can’t be overlooked either because it exists — but it forgets a structural problem that is going on in the world. There is a process within the capitalist productive structure that is changing in the entire world. The productive structurization that started in the 1950s and 1960s is changing due to new technologies and materials that are used today. The Fordist production model created large amounts of stock, used the logic of the production line and permanently produced cyclical crises of overproduction. [v] This has changed in the whole world in part through use of the Toyota production model, which is being perfected around the world. I can’t go too far into this because my answer would become very long and complex but we are at a time in history when the world’s largest taxi company doesn’t own a single taxi. The largest hotel company doesn’t own a room. Large businesses no longer have formal employees. This process of weakening and outsourcing in the workplace is a reality for the entire world. Why am I saying this? Because this impacts the working class’ organizational instruments. It was one thing to hold a strike during the days of the Fordist model. If you shut down one sector of a factory it would completely freeze the others. Today many sectors are connected from a labor and financial standpoint. Companies centralize some of their activities and outsource others to various locations around the World. Many workers are now autonomous, without any labor rights whatsoever. So the instrument of the strike, which was fundamental to the working class for a long time, is no longer possible in many sectors of the economy. Many autonomous workers cannot strike because if they stop producing, they stop receiving, and they don’t have any financial or physical security. So we have a fundamental question here, from my point of view, and we are debating this within the left. The tools that the working class produced throughout history are not enough to confront the current political problems because they are, generally speaking, defensive measures. They were produced in a specific time in history when capitalist development still allowed advances for the working class. We are entering a new phase in history in which capitalist development is producing setbacks for the working class and it is hard to launch an offensive against this model. It is affecting the union movement. Look at the metallurgical workers in São Paulo’s ABC region, who formed the basis for the birth of the PT party. [vi] During the 1960s there was a huge number of metallurgical workers in the region. Today there are 13,000 metallurgical workers in the ABC. During the 1960s and 1970s there were 90,000. And today, with 13,000, they produce a lot more than they did back then. The odds are that this number of metallurgical workers is not going to go up, it will diminish. You can say the same thing about the bank tellers, who suffered huge layoffs during the process of computerization, and all of the other sectors of the working class. This has an impact on the working class’ political struggle. Is this the only justification? No, but it is a challenge to build new forms of working class organization and representation, to form a dialogue with the working class where it lives, that incorporates location, and integrates regions in ways that enable effective confrontation. I will take a second here to talk about a few mistakes made by the left. One of them was to separate the economic and political struggles. Delegating the economic struggle to the social and labor movements and the political struggle to the Party was a serious mistake. The social and union movements ended up falling into corporatism and economics, and the Party disconnected from the people’s daily lives and turned into a bureaucracy. You cannot separate economic struggle from political struggle. The economic struggle is also a political struggle because you can’t separate the present from the future. We are engaged in an important confrontation at the moment but we have to plant what we want in the future now. I will use agriculture to explain this. If you want to harvest avocados, you have to plant an avocado tree. There is no other way to do it. So, if we want a more just society with more solidarity, we have to plant solidarity here and now. If we want a society in which men and women participate equally we have to open up spaces of equality here now, including inside our own homes. If we want a new type of society with new values, we have to cultivate and produce these values in the hearts of our organizations here and now. Since theory cannot be separated from practice, it should have developed like this: new movements have to be built and have to incorporate this concrete economic struggle in a manner that engages with people’s daily lives. An organization that does not respond to the concrete needs of its base doesn’t have a reason to exist. Concrete needs have to be integrated to the need of the political struggle. Conversations about daily life, connected to survival, have to be integrated with dialogues about what kind of society we want in the future. These are the challenges that are out there. But to finish my answer to the question — fine, if we don’t have these new instruments, should we throw everything that the workers ever produced in the garbage? No, because we produced the best that we could. Nevertheless, these instruments are not strong enough to overcome all of the challenges of the moment. We have to modify these instruments and produce new instruments to meet new challenges. Some sectors of the left want to build a new reference point in the masses by passing over historically constructed instruments and tactics. It’s obvious that you have to be critical, but you do not build an instrument of popular reference by annihilating another instrument. This is the old problem of vanguardism on the left. Many sectors in the left commemorate the defeat of other left sectors. This is not revolutionary, this is anti-revolutionary. Because new instruments should not be created through the destruction of other instruments, even if they are full of problems and limitations. Whoever has no problems can throw the first stone. Therefore, you have to be humble and understand that we are all individually weak and even while uniting the entire left we are still losing the battle. We are being defeated. So we have to understand that there are a lot of challenges ahead to organize the working class, most of which did not join the Brazilian political struggles. We do have a working class militancy that has been very important. If we hadn’t taken it to the streets the coup would have consolidated to destroy the Brazilian left and we are resisting. But this is still too small to oppose this entire offensive by big Capital in Brazil. I think the situation is beginning to change, though; there is a politicization process underway in Brazil and I hope that we will have historic patience, while at the same time, initiatives to increase people’s participation, to not always speak to the same people, to modify methods within the left, within our organizations that enable dialogue with the Brazilian people, the working class to, first, understand this moment in history and second, to mount a people’s offense to defeat the coup government in Brazil. The political conjuncture in the United States at the moment is very bad, and there is a growing so-called “alt-right,” with fascism and neo-nazism on the rise, even in the White House. Some people are aligning themselves with the Antifa movement working against these trends. Is there anything you would like to say to the people fighting against fascism in the United States? Fascism is a danger to humanity, and it’s not like we don’t see it down here… we deeply understand it. In all historic times of crisis, alternatives appear, like war, but there is a contradiction. Crises are propitious moments for debate about systems and their contradictions. It is a conducive moment for political debate but during crisis, retrogressive ideas like fascism always arise, and they have to be fought. All sectors have to come together to fight this. This isn’t even a question of ideology. If you are human, you have to fight fascism, and its retrogressive ideas and everyone has to unite. It doesn’t interest me who is at the forefront, who is behind or who is on the side, but all sectors have to unite to face this. This implies that a degree of generosity and patience is needed. And I believe that the U.S. working class is going to face this and will be victorious, just as we will be here in Brazil and other parts of the world. One of our challenges is how we can unite internationally. It’s not enough to struggle just in Brazil, but it has to be done in Brazil just as it has to be done in the United States and every part of the world. We need local actions, but they have to connect to struggles across the entire world. We have to confront these fascist ideas and face the retrogression with the goal of producing new ideas for the world. We need new ideas for economic and social sustainability, to solve the problems of hunger and extreme poverty and to think about what kind of world we need to suit the generations that come after us. I wish lots of successful struggle and lots of luck to you in the United States. And, look, you have a fundamental role. The struggles in the United States have a fundamental role for Brazil and for the entire world. We support you, and we believe that you will be able to effectively face the biggest corporations that practically dominate the entire planet. You can always count on our solidarity. [i] “Após anistia de R$ 8,6 bilhões, 2/3 da bancada ruralista votam a favor de Temer – Notícias.” Política. Accessed September 06, 2017. https://noticias.uol.com.br/politica/ultimas-noticias/2017/08/03/apos-anistia-de-r-86-bilhoes-23-da-bancada-ruralista-vota-a-favor-de-temer.htm. [ii]“The real Brazil: the inequality behind the statistics.” Christian Aid. Accessed September 06, 2017. http://www.christianaid.org.uk/whatwedo/eyewitness/americas/brazil-inequality-statistics.aspx. [iii] “US Role in 1964 Brazilian Military Coup Revealed: National Security Archive.” Dominion Full. Accessed September 06, 2017. http://www.dominionpaper.ca/international_news/2004/04/06/us_role_in.html. [iv] Julio, Menezes Neto Antonio. “The Catholic Church and the Rural Social Movements: the Liberation Theology and the Movement of the Landless Rural Workers.” Caderno CRH. Accessed September 06, 2017. http://www.scielo.br/scielo.php?script=sci_arttext&pid=S0103-49792007000200010. Schwendler, Sonia. “A PEDAGOGIA DE PAULO FREIRE INSERIDA NO CONTEXTO DOS MOVIMENTOS SOCIAIS .” Accessed September 06, 2017. http://www.paulofreire.ufpb.br/paulofreire/Files/seminarios/mesa13-c.pdf. “Em nota, MST se despede do filósofo marxista Leandro Konder.” Movimento dos Trabalhadores Rurais Sem Terra. November 13, 2014. Accessed September 06, 2017. http://www.mst.org.br/2014/11/13/em-nota-mst-se-despede-do-filosofo-marxista-leandro-konder.html. Rosa, Leandro Amorim, and Ana Paula Soares Da Silva. “Práxis política no MST: uma leitura a partir de Vigotski e Gramsci.” Psicologia: teoria e prática. Accessed September 06, 2017. http://pepsic.bvsalud.org/scielo.php?script=sci_arttext&pid=S1516-36872016000100006. [vi] The ABC region is a series of industrial suburbs of São Paulo that have around 3 million inhabitants, which is traditionally, the center of Brazilian industrial production. It gets its name (ABC) from the three largest suburbs: Santo André, São Bernardo and São Caetano.